I like when it’s easy to change something ugly into something pretty in a few minutes, even if it’s just a tape dispenser… I love instant gratification crafts. Yes. I like to decorate my world. I like to wear lacy skirts. And stop, even when someone might look, and just lift my head towards the sunshine and let its warmth seep into me. And today, I did really enjoy staying inside and not going outside for even a minute – because it was raining the entire day. Sometimes staying indoors is the best choice, always remember that. This entry was posted in Crafts and tagged before and after, decorate life, quick craft, tape. Bookmark the permalink. Thank you SO much for sharing your vision and your talents. I am inspired every time I visit. Hanna, what a great idea! Even a tape dispenser can look as it belongs to you, this made my day. Thanks for beeing such an inspiring person. This really makes me smile. Such a great idea! Beautiful! So easy and so clever! Cute, cute, cute! Oh yes lady, you know how life’s got to be lived! Now why have I never thought of doing that. Thanks for the great idea, Hanna. I’m going to pretty up my tape dispenser right now. What an awesome idea! 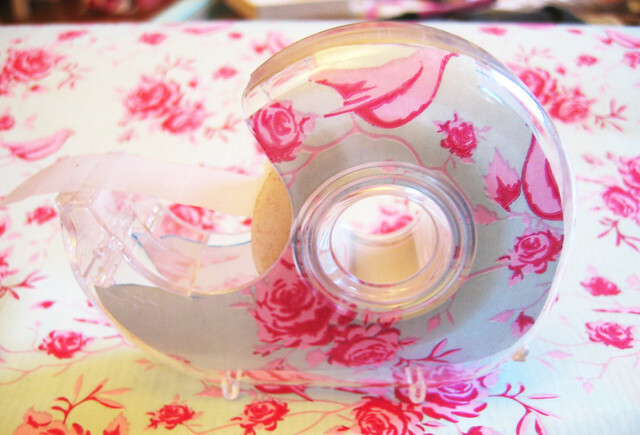 That is definitely the prettiest roll of tape I’ve ever seen! SO pretty! What a lovely and simple idea. What a great idea to pretty up a simple thing. I just pinned it. I love it. Himla kul idé. Jag var tvungen att testa och det gick både snabbt och blev väldigt fint! Tack för tipset. Jag har bloggat om min variant av tejprullarna, men förstås länkat till dig.